Marsh's Symphony on the Prairie is one of our favorite perks of living in Indianapolis. 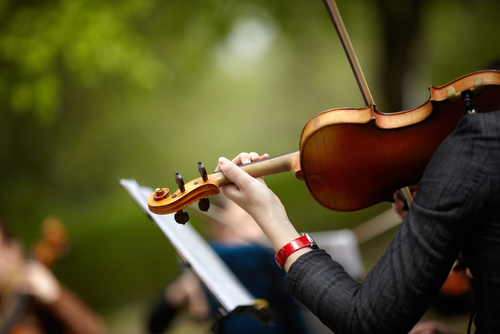 Not only do you get to hear the sounds of the Indianapolis Symphony Orchestra, you get to do so while enjoying the great outdoors at Conner Prairie in Fishers. What's not to love? What is Conner Prairie, anyway? In case you've just moved to the area (or will be soon), you may not have heard of Conner Prairie. It's an outdoor, living history musuem that's on 200 beautiful acres in Fishers. From April to October, you can visit historic areas. Think of it like going back in time and being able to interact with the people of the pioneer days. You can get up close and personal with the livestock in the Animal Encounters Barn or throw tomahawks at the Lenape Indian Camp. It's an awesome way to step back in time. What does Conner Prairie have to do with the Symphony? Every summer, Conner Prairie hosts the Indianapolis Symphony Orchestra for evening performances in their ampitheater. Each year, the Indianapolis Symphony Orchestra performs a variety of fun music from many genres and generations of music - including classical, rock, pop, folk, big band, disco and jazz. This year, you can choose from rockin' options including music from the Beatles and the Beach Boys or something more traditional like Gershwin's Rhapsody in Blue. If you're especially patriotic, you can enjoy the Star Spangled Symphony which includes a fireworks display at the finish (weather permitting, of course). Bring your family to a fun-filled summer evening where you can lounge on a blanket and enjoy a picnic with a larger-than-life soundtrack!